By dipping a ladle or cup or other nog-containing device, the imbiber hereof hereby acknowledges and accepts that that he, she, it or they will possibly become inebriated, intoxicated, drunk or "three sheets to the wind." The management accepts no responsibility or liability for any accidents that may occur whilst blinded by wearing a lampshade, or driving Under the Influence. Management recommends that all imbibers hereof arrange for a designated lampshade wearer who has not been nogged. Having someone else drive post-nog would also be a Good Idea. We would list the intoxicants that constitute the aforementioned Nog of the Egg, but fear that doing so would lead to a visit by the Fire Marshal, who would order that all open flames within 50 feet of the Nog be extinguished. 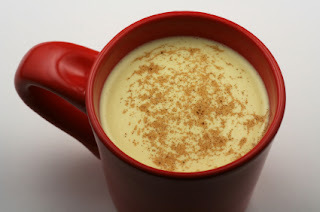 Thus, we leave the exact contents of this Nog to your imagination, as supplement by your taste buds.